Bag yourself a bargain at the Bristol Show this weekend! | What Hi-Fi? Bag yourself a bargain at the Bristol Show this weekend! If you can join us at the Bristol Sound & Vision Show this weekend, not only will you get to see all the latest hi-fi and home cinema kit, but you'll also get the chance to pick up some handy discounts should you decide to buy. Save £100 on the Award-winning Audio Pro Allroom Air One (Best wireless speaker £400+, Awards 2013) at the show. 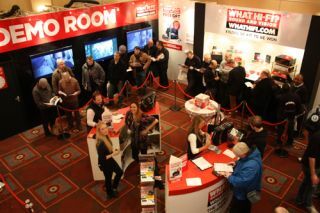 A 10 per cent show discount plus a free Wi-Fi dongle (worth £29) with every X10/X30 purchased at the show. 20 per cent off all Dynaudio Xeo exclusively at the show! Epson EH-TW6100 projector (Best Buy £1000-£200, Awards 2013) with a free blu-ray (LG BP325) and 12 months subscription to Netflix. By customer redemption only. Free pair of Spirit One heaphones in red with any pair of Aria speakerss bought at the show (the 906 model must include matching stands). Buy any Goldring or Music Hall turntable at the show and get a Milty Zerostat free of charge plus the standard show discount. Buy an E305 5.1 speaker system at the show and get a free stand worth £150. 15 per cent off any Libratone Live/Lounge/ZiPP/Loop. 20 per cent off purchases of two or more Libratone products. Save £500 on a pair of original Neat Motive 1s. Save 300 on a pair of original Neat Motive 3s. £100 off the HD30 full HD 3D projector including two 3D RF glasses. Buy an HD91 LED projector – launched at the Show – and get four pairs of 3D RF glasses free OR one of 4 motorised screen options. 25 per cent off the decco65 integrated amplifier when bought at the show. Home cinema receiver/Blu-ray player packages under £500, plus Blu-ray players for under £100. Free BDP-LX55 Blu-ray player with every LX receiver purchased at the show. Buy a model Twenty 21 or Twenty 22 at the show and get a free pair of Twenty stands worth £300. Buy any Q Acoustic speakers at the show and claim a free QED speaker cable or interconnect to the same value as the show discount. Buy a pair of the new Q Acoustics Concept 40 speakers at the show and claim a free bottle of champagne plus the show discount. Save £150 on a five-star Rega DAC. Save £50 on a Rega Ear headphone amplifier. 10 per cent off and a free CarryPack worth £40 with each R1 sold at the show. 20 per cent off all R series sold at the show. In addition to the above savings, there's also 15% of all other items over £100 sold through the show sales desk in rooms 211 and 311. For even more bargains check out the official show guide. And for full details of all the new products at the show, see our dedicated Bristol Show blog.